Who do you trust when everyone is suspect? A Killer in the City brings TV news camerawoman Karli Manford into too close contact with Atlanta’s hottest homicide detective, Brent Logan, when a string of murders turns personal. Somehow, Karli finds herself inside the story instead of documenting someone else’s troubles. An ever-escalating pattern of danger to Karli forces Brent Logan to protect the one woman he has always avoided. Serve and Protect are more than just words to him. Now, he must defend the one woman he wants most to avoid, the woman who got his brother shot years ago. Can be read as a stand alone novel, but better read in order. 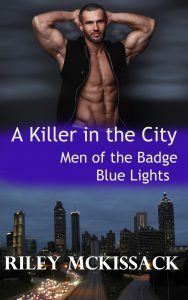 Part of the Men of the Badge series, a subset – Men of the Badge Blue Lights Books introduce new characters. Stories have recurring characters but each story is separate and complete.